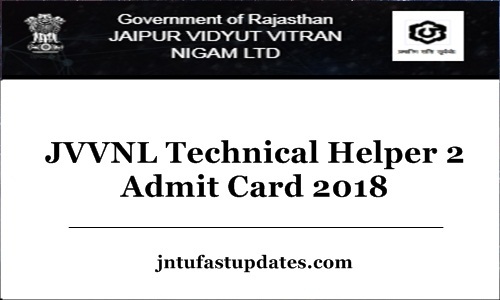 JVVNL Helper 2 Admit Card 2018: Jaipur Vidyut Vitran Nigam Limited is set to organize the Technical Helper II Screening test shortly. All the hopefuls applied for JVVNL Helper posts have to give the examination in order to get the job. Aspirants need to qualify in the written test round and interview rounds with good merit to get the jobs as Technical Helper in JVVNL. To attend the test, aspirants have to download JVVNL Technical Helper admit cards initially. The admit card/call letter will be accessible to download on RVVNL or JVVNL official websites, jvvnl.onlinereg.in or energy.rajasthan.gov.in. Candidates can visit any of the websites and download the admit card. The admit card link will be activated before 2 weeks of the examination (approximately). Candidates can visit the official portal and download the hall ticket when it available to download. Do not forget to carry the hall ticket to the examination as it is the most important document to show at the time of verification. Without showing the admit cards, aspirants will not be allowed to continue with the exam. They will lose the chance to write the test. Hence all applicants are hereby informed to download and carry the admit cards as a must. Jaipur Vidyut Vitran Nigam Limited (JVVNL) is one of the state-government functioning department in the state of Rajasthan. The organization works for power supply, production, and other aspects. The JVVNL annually issues various job notifications to hire the suitable candidates into various designations. This year the organization has announced a large number of vacancies for Helper-II posts. It has notified 2412 Helper-II posts. Candidates wishing to get JVVNL Jobs in Rajasthan state have applied for the announced posts till the last date 21st September. The application process for Rajasthan JVVNL Helper posts has been started on 7th September. Within the application schedule, the organization received a large number of applications from the eligible aspirants. The JVVNL selection process includes various rounds such as written test, interview round. Candidates have to qualify the rounds to get the jobs as technical helper in Jaipur. Aspirants competing for the Technical Helper posts in Rajasthan can download the admit cards before 2 weeks of the examination (approximately). Candidates can download the admit cards from JVVNL official website, jvvnl.onlinereg.in or from the RVVNL official website, energy.rajasthan.gov.in. The admit card link will be found on the official portal page when the organization releases it. Just by clicking on it, aspirants can download the call letter for the examination. As all the hopefuls know to admit card is the most important document, they can download and keep it safe to carry to the examination. Candidate’s name, register number, hall ticket number, date of birth, signature, and photograph will be printed on the admit cards. Candidates can also find the information on their examination venue, exam date, and timings from the admit cards. Go through all details clearly after downloading the admit cards. Take a printout of it and keep it safe to carry to the examination. Applicants competing for Rajasthan Technical Helper posts can complain to the authorities if any printing mistakes appear on the name or other columns. The JVVNL will take suitable steps to correct the details. Search the JVVNL Helper 2 Hall Ticket download link in organization website. Check the information in JVVNL Helper Hall Ticket 2018.